HomeScene NewsScene News: Metal band FLYNN EFFECT go on tour ahead of their July 6th release of MONUMENT. Scene News: Metal band FLYNN EFFECT go on tour ahead of their July 6th release of MONUMENT. Powerful metal outfit Flynn Effect have announced the Friday July 6 release of their new EP Monument! 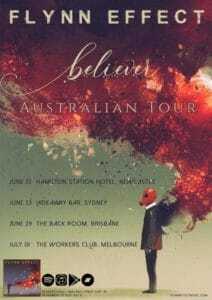 The Brisbane-based band are celebrating this release with a first taste of the EP, a new single and video entitled “Believer” – AND announcing single release tour dates in June! Pre-orders for the EP are now available, along with new single Believer going live for streaming at Apple Music and Spotify. The band are embarking on single release tour dates in June in Newcastle (Hamilton Station Hotel June 22), Sydney (Hideaway Bar June 23), Brisbane (Back Room June 29) and Melbourne (Workers Club July 1). 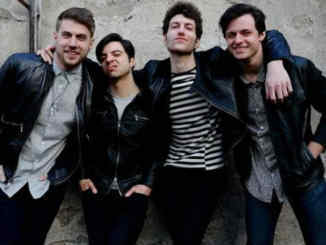 Surfacing as a live band in August 2014 and releasing their first album Skin just a few months later, Flynn Effect quickly established themselves within their scene as a force to be reckoned with – delivering a refreshing take on alternative rock and a theatrical live show featuring the band’s own self-created automatic lighting system, CO2 and pyrotechnics. Flynn Effect’s ambitious live performances have seen the band share the stage with rock and metal royalty, including Lacuna Coil, Wednesday 13, Davey Suicide and Seether, as well as share the stage with Australian heavyweights Orpheus Omega, Osaka Punch and Darkcell. In 2018, Flynn Effect are embarking on a new journey with the release of a new EP and a national tour in its support.